All Dunnsville homes currently listed for sale in Dunnsville as of 04/25/2019 are shown below. You can change the search criteria at any time by pressing the 'Change Search' button below. If you have any questions or you would like more information about any Dunnsville homes for sale or other Dunnsville real estate, please contact us and one of our knowledgeable Dunnsville REALTORS® would be pleased to assist you. 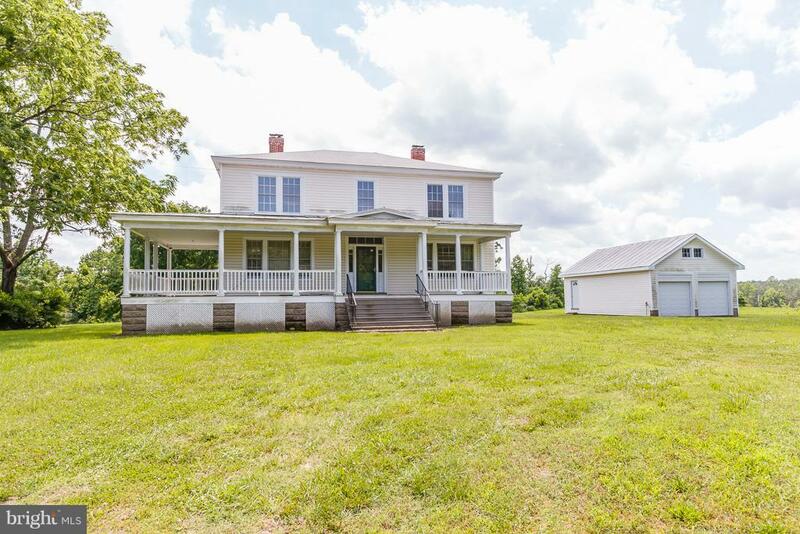 "Campbellton, an American Foursquare, Hipped Roof built in 1917 situated on 63 Acres-17 Open Ac./46 Ac. in reforested pines in 2017, fronting on Rt. 17 South, Tidewater Trail & Johnville Rd. at Dunnsville, Va. Featuring a grand center hall,formal rooms,5 Bedrooms (1 on 1st Flr. ),2 full Baths,Country eat-in Kitchen,Sitting/Study Rm.,moldings,french doors,wood flrs.,wraparound porch & 2-Car Garage." "Campbellton,an American Foursquare,hipped roof built in 1917 situated on 63.619 Ac. fronting on Rt 17, Tidewater Trail & Johnville Road at Dunnsville, Va. Featuring a grand center hall,5 Bedrooms,one of which is a large downstairs bedroom,2 full Baths,Sitting Room/Study off upstairs bedroom,2 Fireplaces,plaster walls & ceilings,hardwood & pine flooring,2 Stairways,charming eat-in Kitchen w/walk-in pantry & service window to formal Dining Room,3 sets of French doors,one of which is in formal Living Room & opens to wraparound front porch,enclosed rear porch & a 10' wide wraparound porch on the front.There is an artesian well and a 2-Car detached Garage with walk-up floored attic.The property consists of 17 Open Acres and 46.619 Acres, reforested in 2017.Short distance to the Town of Tappahannock & Town's amenities,shops,restaurants,golf course,fitness center,health care facilities & hospital.Public boat landing within 1/2 Mi. on Piscataway Creek on short run to two local marinas on the Rappahannock River.Located 1 hour from Richmond,1 hour from Fredericksburg & 2.25 hours from Washington D.C. UPGRADES - New artesian well in 2011,vinyl on house & garage - 2011,front porch flooring replaced with trek - 2011,upgrade on 5 Bedroom septic system - 2013,both fireplace chimneys repaired & inspected - 2015,new water heater-2013,Termite treatment - 2015. Replanted-2017." "Charming Three Bedroom Vinyl Rancher in small subdivision with close proximity to Rt. 360 for easy commute to Richmond.Move-in ready with new carpet,new wood-like laminate flooring & freshly painted. 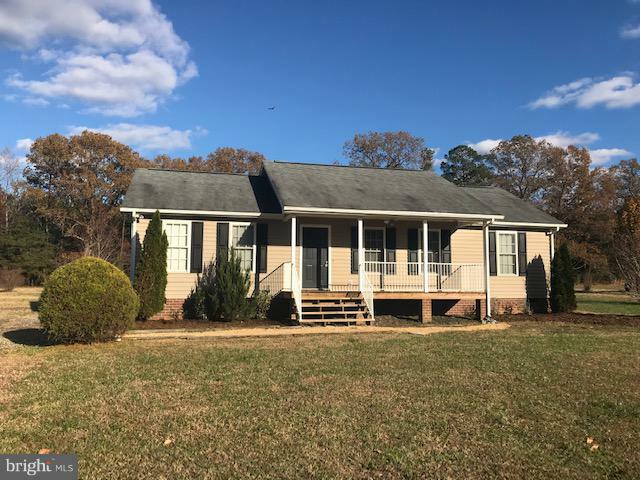 Lovely new wood-like laminate in Living Room,Kitchen & Dining Room, deck on rear & shed.Short run to Watts Supermarket for local atmosphere & short run to Tappahannock for Town's amenities,health care facilities & hospital."